Yesterday, the United States Supreme Court rejected an appeal made by Republican state legislators over the changes made this year to Pennsylvania’s congressional district map. In January, the Pennsylvania state Supreme Court overturned the 2011 drawn map, deeming it unconstitutional and favoring Republicans. A new map was redrawn that was considered to be more competitive. Under the previous map, Republicans held a majority of the Congressional seats in the state, while FiveThirtyEight currently projects the Democrats to make a couple seat gain in the election next week under the newly drawn map. This latest appeal to the U.S. Supreme Court was an effort for the court to “consider the matter before the 2020 election cycle,” according to WITF. PoliticsPA dissected the differences between the old and new map in February. They follow the geographical lines, long angled districts. it should encompass more from a total cities/towns perimeter that not following county and topical maps!! Amanda Holt’s plan would be the fairest for both sides. republican pushed their “luck” too far but this is insane how the court has mandated it and it’s also unconstitutional. 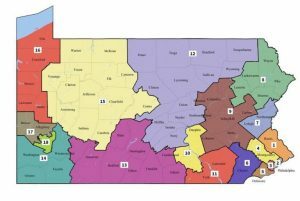 Turzai and Scarnati took the findings of the Pa Supreme Court on redistricting to the US Supreme Court claiming it was an over-reach of their judicial powers. How much of tax payer funds did rhey waste on this escapade? Well, it is a states rights issue which is what Conservatives claim to believe in until they don’t. I am prepared to say I see a net 3 for the D’s in the US House out of PA. 3 are obvious – Lamb, Chrissy and whoever is running in the Meehan seat for the D’s. The D’s lose Lamb’s old seat but Wild wins. I do think Fitz will hold. The ads from the Pacs are some of the most negative I have ever seen and, frankly, at least one is a flat out lie. Still, negative ads work. The race will be close. The Kelly race and Perry race will be close as well (within 5-7) but the GOP will hold. Then it is up to about 6 other states that will determine who controls the House next cycle. A much closer call than people realize. What won’t be close are the PA races for Sen and Gov. Easy double digit wins for both Dem incumbents. Not exactly going out on a limb with that prediction. King Scarnati has lost and, in the process of being unwilling to compromise, also lost out on at least a chance to mitigate the effect of the new districts. What Scarnati does not realize is that Pa is not Alabama and the districts drawn were not reflective of the political make-up of Pa. In the end, the Pa Supreme Court stepped in and thwarted a power grab by the Republican leadership in Pa to guarantee that ALL Pensylvanians have a right to have their votes count through fair redistricting. Whether intended or not unfair redistricting is, in essence, voter suppression. This is a bad decision, we must remember that the representatives are from the people and Judges are appointed. I don’t care whos dog is in the fight but we elected the representatives to do a job not any judge. The PA justices that made the decision were elected. Sorry, Wolfe. PA state supreme court justices are elected by the people of the Commonwealth.